I played for such a lovely event last night that I felt I wanted to tell people about it. I was asked to play for a wonderful small charity called 'VOCAL'. (And by the way, apologies for the title, I just couldn't resist the play on words!) The truth is that the instrumental ones are definitely the amazingly dedicated staff and volunteers at VOCAL. 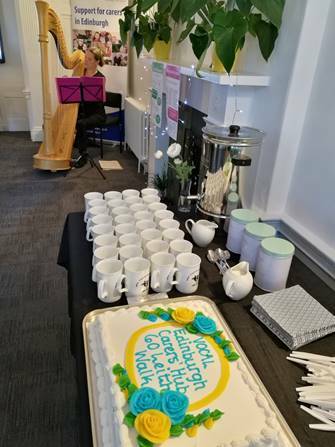 VOCAL do brilliant work supporting carers in Edinburgh and Midlothian, and last night they were having a celebration to mark their entry into new premises on Leith Walk in Edinburgh. Although I always think of Leith Walk as being very busy and noisy, the new Edinburgh Carer's Hub is set back from the clamour of the street and even has a beautiful garden for carers to relax in. The event itself had a very special atmosphere - one of peacefulness, compassion, generosity and joy. Everyone was so welcoming and friendly. The Chief Executive of the charity commented to me that amongst those people present in the room there were around 500 combined years of caring experience, and I think this came across clearly. What a privilege to be part of the celebrations!